3.7 out of 5 based on 20 bloggers and 5 commenters. K-On!! is a free premium blogger template with 2 columns, magazine-styled, right sidebar, an exclusive design for Blogger, footer columns, social bookmarking icons, posts thumbnails, breadcrumbs, related posts support, well designed threaded comments, cute design, girly looking and gradients. 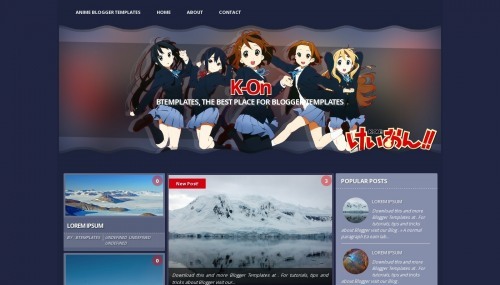 Excellent template for blogs about anime or education. 5 Questions and comments on K-On!! wowwwww saya berterimakasih banget….itu sungguh menakjubkan…. dan jangan lupa saya minta saran dari klian semoga blog saya berguna..